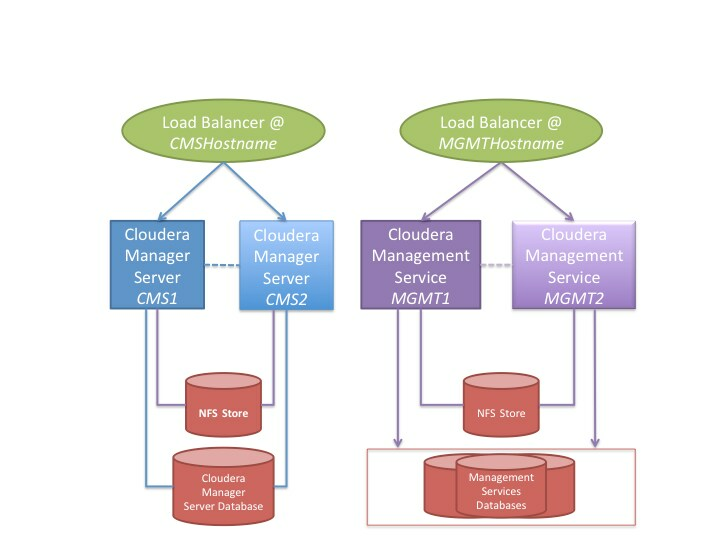 At a high level, you set up Cloudera Manager Server and Cloudera Management Service roles (including Cloudera Navigator) on separate hosts, and make sure that network access to those hosts from other Cloudera services and to the Admin Console occurs through the configured load balancer. Cloudera Manager Server, Cloudera Navigator, and all of the Cloudera Management Service roles that use a relational database should use an external database server, located off-host. You must make sure that these databases are configured to be highly available. See Database High Availability Configuration. You configure other Cloudera Management Service roles (such as the Service Monitor and Host Monitor roles) that use a file-backed storage mechanism to store their data on a shared NFS storage mechanism. Note: The hostnames used here are placeholders and are used throughout this document. When configuring your cluster, substitute the actual names of the hosts you use in your environment. Do not host the Cloudera Manager or Cloudera Management Service roles on existing hosts in a CDH cluster, because this complicates failover configuration, and overlapping failure domains can cause problems with fault containment and error tracing. Configure both the primary and the secondary hosts using the same host configuration. This helps to ensure that failover does not lead to decreased performance. Host the primary and secondary hosts on separate power and network segments within your organization to limit overlapping failure domains. This procedure demonstrates configuring the load balancer as two separate software load balancers using HAProxy, on two separate hosts for demonstration clarity. (To reduce cost, you might prefer to set up a single load balancer with two network interfaces.) You use one HAProxy host for Cloudera Manager Server and another for the Cloudera Management Service. Note: HAProxy is used here for demonstration purposes. Production-level performance requirements determine the load balancer that you select for your installation. HAProxy version 1.5.2 is used for these procedures. HAProxy 1.5.4-2 has a bug that affects the functioning of tcp-check. Cloudera recommends that you use version 1.6.3. Reserve two hostnames in your DNS system, and assign them to each of the load balancer hosts. (The names CMSHostname, and MGMTHostname are used in this example; substitute the correct hostname for your environment.) These hostnames will be the externally accessible hostnames for Cloudera Manager Server and Cloudera Management Service. (Alternatively, use one load balancer with separate, resolvable IP addresses—one each to back CMSHostname and MGMTHostname respectively). CMSHostname is used to access Cloudera Manager Admin Console. MGMTHostname is used for internal access to the Cloudera Management Service from Cloudera Manager Server and Cloudera Manager Agents. Set up two hosts using any supported Linux distribution (RHEL, CentOS, Ubuntu or SUSE; see CDH and Cloudera Manager Supported Operating Systems) with the hostnames listed above. See the HAProxy documentation for recommendations on configuring the hardware of these hosts. Create databases on your preferred external database server. See Cloudera Manager and Managed Service Datastores. Important: The embedded Postgres database cannot be configured for high availability and should not be used in a high-availability configuration. Configure your databases to be highly available. Consult the vendor documentation for specific information. MySQL, PostgreSQL, and Oracle each have many options for configuring high availability. See Database High Availability Configuration for some external references on configuring high availability for your Cloudera Manager databases. The procedures outlined for setting up the Cloudera Manager Server and Cloudera Management Service hosts presume there is a shared store configured that can be accessed from both the primary and secondary instances of these hosts. This usually requires that this store be accessible over the network, and can be one of a variety of remote storage mechanisms (such as an iSCSI drive, a SAN array, or an NFS server). Note: Using NFS as a shared storage mechanism is used here for demonstration purposes. Refer to your Linux distribution documentation on production NFS configuration and security. Production-level performance requirements determine the storage that you select for your installation. This section describes how to configure an NFS server and assumes that you understand how to configure highly available remote storage devices. Further details are beyond the scope and intent of this guide. There are no intrinsic limitations on where this NFS server is located, but because overlapping failure domains can cause problems with fault containment and error tracing, Cloudera recommends that you not co-locate the NFS server with any CDH or Cloudera Manager servers or the load-balancer hosts detailed in this document. Note: Later sections describe mounting the shared directories and sharing them between the primary and secondary instances.